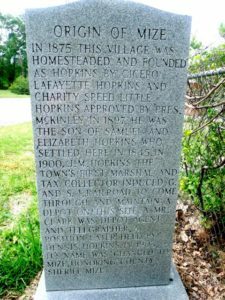 In 1875 this village was homesteaded and founded as Hopkins by Cicero Lafayette Hopkins and Charity Speed Little Hopkins approved by President McKinley in 1897. He was the son of Samuel and Elizabeth Hopkins who settled here in 1845. In 1900, J.M. Hopkins the Town’s first Marshal and Tax Collector induced G. and S. I. Railroad to come through and maintain a depot on this site. A Mr. Clark was depot agent and telegrapher, a position later held by Dennis Hopkins. 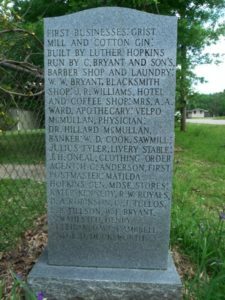 In 1903 it’s name was changed to Mize, Honoring County Sheriff Mize. Grist Mill and Cotton Gin- Built by Luther Hopkins and ran by C. Bryant and sons. General Merchandise Stores- Kater Kennedy, R.W. Royals, D.A. Robinson, C.J. Tullos, L.B. Tillson, W.F. Bryant, A. Wahlsted, Henry Sullivan, Dave Cambrell, and L.D. Ducksworth.